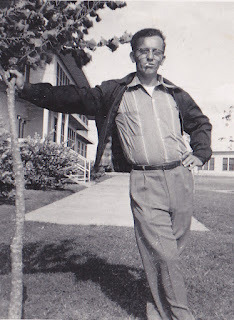 The picture I chose of my dad was taken in 1955... 18 years before I was born. Although I have pictures of him from my childhood – the way I remember him – but I like this picture of him more than any of those. This is him in his youth, in his prime. There's a cockiness in his stance that grew into something larger, into a mental and spiritual indefatigably, which lingered, even when his health and his body began to fail him. The stamp on the back of the picture indicates that the picture was taken – or, at any rate, developed – in November of that year in San Antonio, Texas. 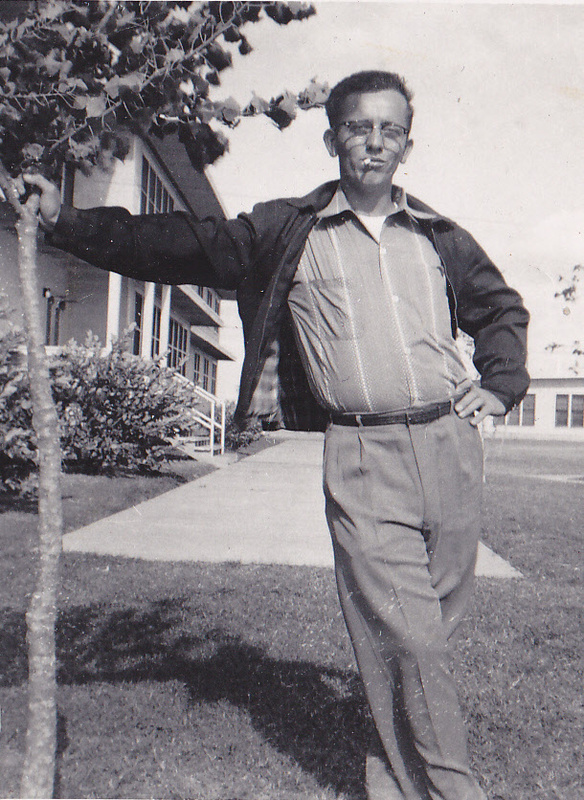 The only thing I know about my dad being in Texas was that after being in that state with two other friends – he in the Air Force, and one friend each in the Navy and the Army – my dad received a letter from the governor asking him to please never return to the state or risk being incarcerated. At least, that's the way I remember him telling the story. And while I'm sure that there was probably some exaggeration involved – the men in my family are prone to exaggeration – I have found there's an element of truth in all forms of exaggeration. Today is the 21st anniversary of his death. Some years it's easier for me to handle than others. This year seems a bit more difficult than I've experienced in a while. Maybe it's because lately I've been acutely aware of his absence. There are times when I still want to ask his advice, still want him to make everything better. I'd ask him what he thinks about my life. Silly, really. I think maybe the reason I care so little about the opinions of other people is because his opinion was always the one that mattered – and in its absence, there is no one who's opinion can act as a substitute. That he is gone doesn't mean I don't still learn from him. That I can't remember the sound of his voice doesn't mean he still doesn't speak to me. It is the blessing and the curse of children to carry their parents with them, in their bones and in their hearts. The imprint is a permanent one. I continue to learn from him because the core of what I learned continues to apply to my everyday life. He teaches me that being honest counts for more; that convictions are worth standing up for; that everyone deserves to be treated with dignity until they've proven otherwise. He also teaches me that I am not less deserving of respect than others so long as I remember these three things. I miss you, Dad. Give'em Hell.